Spartans head coach Mark Dantonio declared his program as a “destination,” not a jump-off to getting something bigger and better. It was a definitive statement, one that will either concretely, positively define the Michigan State football program — or live as a punch line when things don’t develop as planned. Spartans head coach Mark Dantonio declared his program as a "destination," not a jump-off to getting something bigger and better. 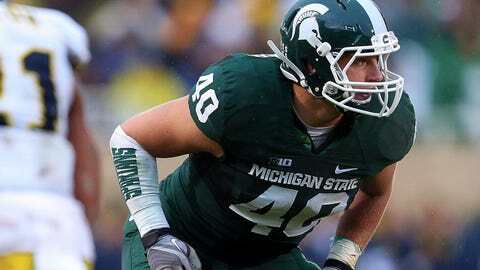 Senior linebacker Max Bullough has been suspended for a violation of team rules. 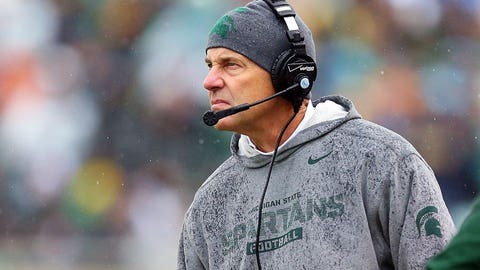 Despite the swirling rumors that Dantonio and defensive coordinator Pat Narduzzi could or should be considered for openings at other schools, both men have made it clear they see the possibilities of making MSU a real, lasting hub of big-time football. Dantonio says he’s not going to consider the Texas Longhorns. Narduzzi withdrew from consideration for the UConn head job. They say they want to stay — for now — and build No. 4 Michigan State (12-1) into a consistent top program that challenges for national titles. They’d like to make a visit to the Rose Bowl more than a once-in-a generation occurrence. But beating Stanford was made a bit trickier Monday, when Dantonio announced, through a very early Monday statement, that he was suspending star senior linebacker and two-time captain Max Bullough from the Rose Bowl. Dantonio cited only the nebulously vague âviolation of team rules" as Bullough’s alleged offense. It’s clearly not good news for the vaunted MSU defense, but in philosophical way, I like it. It shows there are no tiers of rules for MSU players, depending on how valuable you are to the program. Bullough matters a lot to the Spartans, but whatever he did is enough for Dantonio to sit him down for the biggest game of his college career. It’s a sign of somebody who wants to do the right thing, even under the brightest spotlight and when things really matter. I’m sorry this happened to Bullough, but actions have consequences — and it’s encouraging to see a coach follow through. There’s a model for sticking and staying, holding players accountable and being successful in East Lansing, but it hasn’t really been headquartered in football for a while. Head basketball coach Tom Izzo and his predecessor, Jud Heathcote, have combined to do it for nearly 40 years, creating Michigan State’s firm grounding as a super-elite powerhouse. And yes, Izzo has had his flirtation with the NBA, but chose to stay with the Spartans and keep control over his own program. Izzo has a list of players he’s disciplined, from suspending Derrick Nix, and most recently redshirt freshman Kenny Kaminski, to throwing Korie Lucious off the team. â¢ George Perles, the last coach to bring MSU to a Rose Bowl (in 1988), left under a hail of NCAA violations. â¢ The perversely entertaining John L. Smith and the overmatched Bobby Williams were terminated for royally messing things up. â¢ And Nick Saban used Michigan State as a rung in his Larry Brown-esque climb to the top of college football. No hate toward Saban, but he never intended to stay at Michigan State a second longer than required. Dantonio has been running the show since 2007, slowly rewiring the formerly undisciplined Spartans into a better program. It’s been painful and frustrating at times, but this season’s success is making the case that Dantonio and Narduzzi’s work is paying off. MSU football has not yet arrived to the point where pundits, recruits and fans automatically toss its name into the national-title chase like an Ohio State or Alabama. Getting that rare status is going to take a few more years of winning the Big Ten, getting into the national championship playoff chase and landing the right big recruits. Dantonio and Narduzzi know they cannot rest on constantly pushing the program forward. College football is a brutal chase, without a real finish line. The cycle of recruiting, practicing, playing and positioning the program is always rebooting. But knowing where you call home, what your philosophy is and meaning it when it counts are all huge steps forward in pushing Michigan State toward reaching that next level of prominence.